Here stands the cast statue of Luang Por Cham, who helped the people of Phuket put down the Angyee, or Chinese Coolie Rebellion, in 1876 during the reign of Rama V. There are also statues of Luang Por Chaung, and Luang Por Gluam, abbots of the temple during later times. 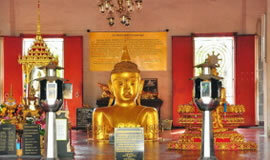 How to get there: Wat Chalong is about 8 km outside town. Take Vichit Songkram Road to the Bypass Road and turn left, and drive for about 10 mins. Wat Chalong is on the left. The beginning of the tin boom in the 19th century led to the construction of many fine mansions and shops that are still well preserved. The architectural style, typical of the region, is described as Sino-Portuguese and has a strongly Mediterranean chracter. Shops present a very narrow face onto the street but stretch back a long way. Many, especially on Dibuk Road, have old wooden doors with Chinese fretwork carving. 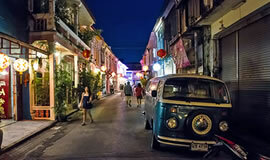 Other streets, forming what might be called "Old Phuket," with similar structures are Phangnga, Yaowarat, Thalang, and Krabi, and a walking tour of the area is easy and delightful. Some other old European-style buildings of note are the Provincial Hall (Sala Klang), the Phuket Courthouse (San Changwat), and Nakhon Luang Thai Bank. A land reclamation project provided abundant new land now used for parks and public facilities at Sapan Hin, located where Phuket Road meets the sea in Phuket Town. In the circle is the Tin Mining Monument, shaped like a large drill bit, dedicated to the memory of Captain Edward Thomas Miles, the Australian who brought the first tin dredge to Phuket in 1909. 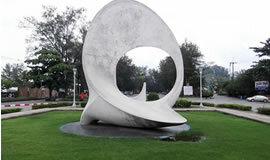 The monument was built in 1969 on the occasion of the 60th anniversary of tin dredging in Phuket. A sport center is located in the park. This temple enshrines a golden Buddha image that sprang up from beneath the earth long ago. The story tells of a young boy who tied his buffalo to what he thought was a post. After doing so, he fell down in agony and died. The father of the boy dreamed that the reason his son had died was for the sin of tying a filthy buffalo to a sacred object, that what the boy thought was a post was in reality the golden peak of the Buddha's conical cap. He told his neighbors the dream and they all went out to dig up the statue but had no success. We are updated daily by our local and international suppliers as to what the best deals are. When you call us or message us, you will get through to an owner operated and run Travel Agency. Should you run into any problems on your holiday and you have to call the emergency contact number we give you, YOU WILL get through to the owner or the manager who will be able to help and advise you. Holiday Packages to Mauritius and the Seychelles. Holiday Packages to Victoria Falls. 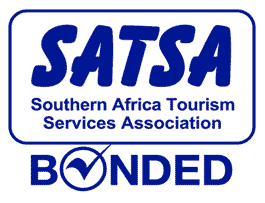 Sign up to get Travel Specials Around Southern Africa and special Holiday offers. 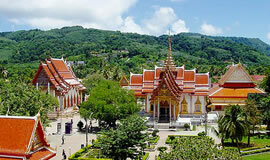 Phuket.co.za is part of the Southern Routes group of travel portals.